Blade Runner is my favorite movie. The first time I watched it, I was awestruck. Although it is over thirty years old by now, the atmosphere and setting left me bewildered. I was so blown away by the environment within the film that I did not understand much of either the story or the symbolism. However, I knew that I liked it. It confused me, but it was one of the most interesting and unique films I had seen. Since then, I have watched it over multiple times, and have come to understand many aspects of Blade Runner that had confused me originally. Even after re-watching it multiple times, however, I was still amazed by it. So when I heard about this book, I decided that I had to read it. 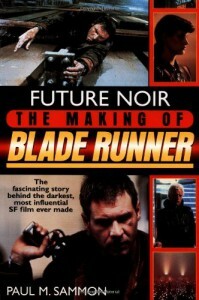 This book goes into all of the aspects of the making of Blade Runner, with all of its significant events and developments recorded, often in the form of interviews with the many people involved in the film-making process. This book also goes beyond just the development of the theater release of the film, and goes into the story behind the Workprint as well as the Director's Cut. Sadly, it does not cover the Final Cut, which was released many years after this book was written. The only other section of the book that I consider lacking is the chapter on the soundtrack, and that is mainly because Vangelis did not want to be interviewed for this book. Besides these few flaws, this book should be required reading for any Blade Runner fan.